Cover the fish with a rather generous layer of fine salt and leave for 20 minutes. Then wash the fish, dry it and leave it to rest for 24 hours. The fish will be more compact in consistency: cut 4 similar sized steaks. Cook the fish (without adding salt) in a vacuum bag at 55-58 °C for 12-15 minutes. Remove it from the bag and cover with the black sauce. Unite all the cold ingredients and leave to dissolve, heating without boiling (about 90 °C) the sweets. Filter. Take the stock and add the tapioca flour. Cook, heating and reducing to obtain a honey-like consistency. Set to one side. Gently remove the blood vessels from the foie gras. Chop it into small pieces and blend. Set the Thermomix to a temperature of 60 °C with the addition of fresh milk. Blend for about 5 minutes and then sieve. Add salt to taste. Heat the cabbage very slowly in the melted butter and season with a little salt. Cook the pasta until firm and drain it into the butter. Flavour and set to one side. 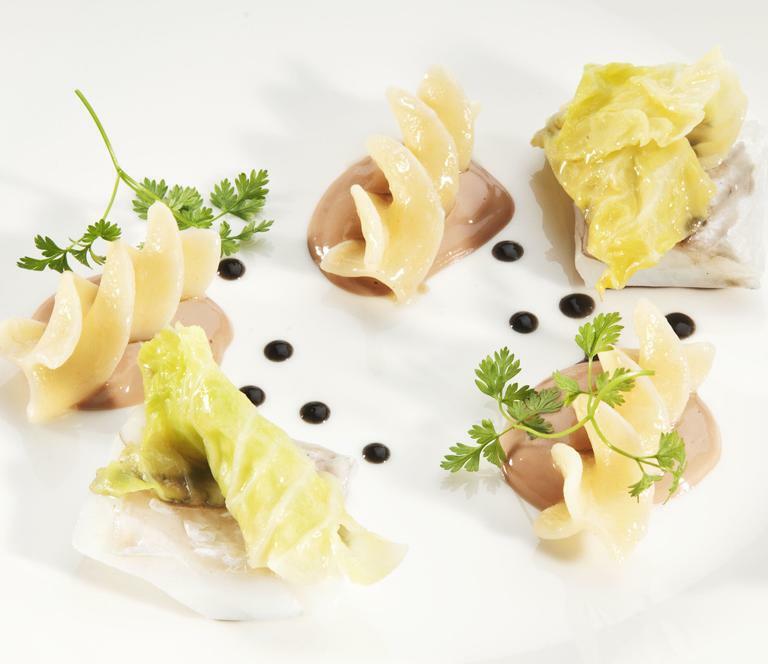 Lay the cod on a plate with a little foie gras sauce, pasta and cabbage by the side. Complete with a few drops of black sauce.